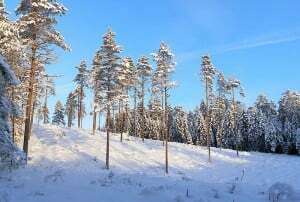 How do “Evergreen” trees survive such long winters? First let’s start with how trees work, and why normal leaves of the typical tree (deciduous) would not survive during the winter. These trees grow large leaves whose great surface area allows for more photosynthesis to occur. However, water is required for photosynthesis to occur. A good amount of water is transported through the tree’s vascular system by xylem and phloem. Much of this water is required to keep leaves alive. If these leaves were to remain alive during the winter months, the water inside them would freeze and kill them anyways. To retain this water, the tree recalls all water back into the wooden parts of the tree and lets leaves “fall” right before the winter. This is known as the dormant state where the tree survives off of the energy created from photosynthesis performed before losing its leaves. Since the leaves had a large surface area, photosynthesis is done in enough quantity to allow the tree to survive with no photosynthesis for a long winter. Have you noticed what grows on Evergreen trees? The most common “leaf” is the pine needle. These are very small and thin needles that can be thought of as a leaf tightly coiled together. They cover themselves in a waxy substance called cutin. These needles also require less water to stay alive and perform photosynthesis than leaf. The small amount of water and protective Cutin coating stop any water from freezing and killing any pine needles. Yes, the tiny leaves do not perform as much photosynthesis as a large deciduous leaf, but these pine needles have the qualities necessary to survive the long winter and continue to do photosynthesis throughout the entire winter and provide continuous energy for the tree. Also, some needles do die, and these are immediately replaced by new, healthy needles. This process is different than the one time “fall” of a deciduous tree’s leaves. We will see many more pine trees in cold northern climates and more deciduous trees in warm southern climates. One can think of an Evergreen as a tree that has a continuous energy fueling its growth, while a deciduous tree flourishes with high energy production for three seasons of the year and then “sleeps” for the winter with its stored energy. If you’re looking to take good care of evergreen trees, it would be best to water any backyard evergreen trees in the season of Autumn to add to its water supply that fuels photosynthesis that goes on (important because of the lack of absorbed water in winter due to it being frozen in the soil). Which tree do you think is more effective at surviving in its own environment? Oak and Maple are my favorite type of tree along with the Leyland Cypress for an evergreen. what would happen if there was lack of snow in the winter and it was 50 degrees plus, all the time? what would happen to the tree its self? Why do evergreen trees have thick and shiny leaves…….